« Can I Get a Tweet For My New Book? 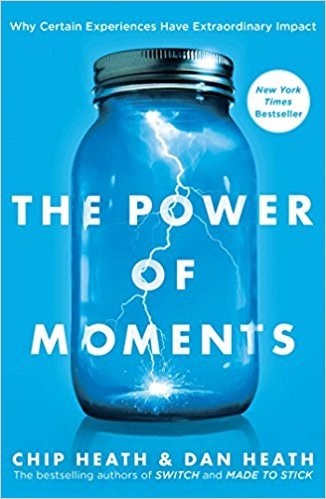 The Power of Moments: Why Certain Experiences Have Extraordinary Impact by Chip and Dan Heath makes the case that we all experience moments that make a huge difference in our lives and that there are things we can do to make them happen. You need to be aware of moments in your life and look for ways to make them happen again for yourself and those you serve. This is a must-read for any leader. We all have defining moments in our lives. This book has two goals. One is to examine defining moments and identify the traits they have in common. Two is to show how to create defining moments by making use of these traits. When we reflect on an experience, we do not average our feelings over time. Rather, we focus on the high and low spots, the peaks, and the pits, along with the beginnings and ends. One or more of the following elements are involved. 1. Elevation: Something happens to elevate the experience from those surrounding it. 2. Insight: Here is where you suddenly realize something about yourself or the world that makes a difference. 3. Pride: This is when you accomplish something special. 4. Connections: Defining messages are social. Special moments become more special when you share them with others. There are three kinds of situations that stand out as moments in our lives. They are transitions, milestones, and pits. The goal is to mark transitions, commemorate milestones, and fill the pits. Here the Heath’s tell some stories of how employers can make transitions like the first day on the job special, how banks can help commemorate savings and mortgage milestones, and how service providers can fill pits as soon as they show up. At the end of this section and each section in the book they include a clinic, which demonstrates how the book’s ideas can be put to use. This entry was posted on Monday, February 5th, 2018 at 7:29 am	and is filed under Book Summaries, Business Books, Education Books, Leadership Books. You can follow any responses to this entry through the RSS 2.0 feed. You can leave a response, or trackback from your own site.